At Longo’s you will find the freshest produce, gourmet deli, highest quality meats, unique grocery offerings and delicious ready prepared meals. Why not pick up a gift card for your family and friends and give them an adventure in food. The gift cards can be used just like cash towards the purchase of merchandise at any Longo's store. This card automatically retains its balance, for easy use. 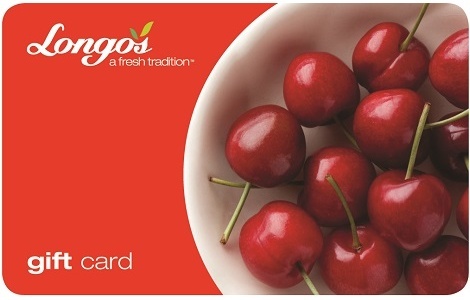 Order your Longos Supermarkets gift cards today! Your use of this Gift Card constitutes your acceptance of these terms. The face amount is the starting balance and will decrease with purchases made. This Longo’s Gift Card may be applied towards the purchase of merchandise at any Longo’s store. This Gift Card is not redeemable for cash and will not be replaced if lost or stolen. Gift Cards can be used multiple times; the remaining balance on your card will be printed on the cash register receipt each time the Gift Card is used. This Gift Card cannot be used at third party businesses or used to purchase gift cards or lottery tickets. The balance on your card can be checked at any Longo’s store.